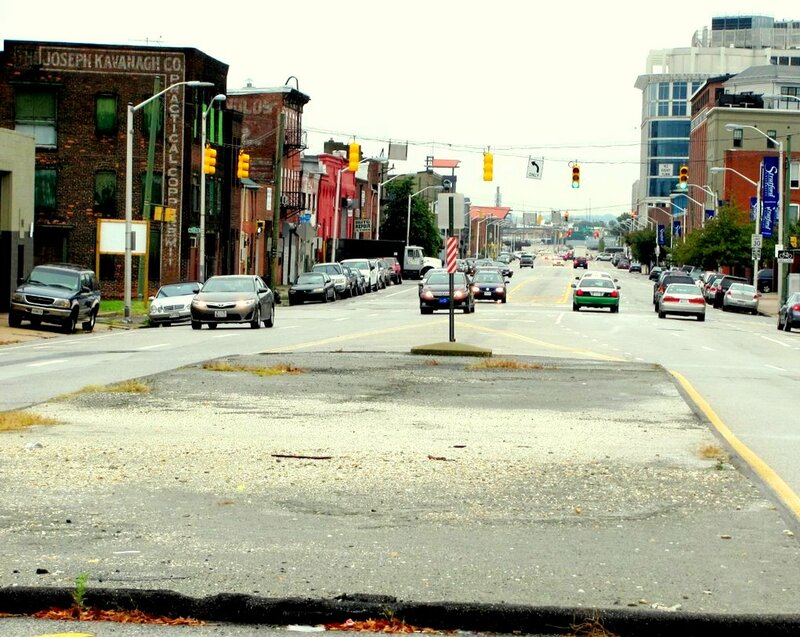 Go East, Baltimore, and seize the opportunities that will arise along the Central corridor. Above: Showing its factory pedigree. Central Ave. looking south at Lombard St. toward future Harbor Point. As Baltimore’s downtown inexorably shifts eastward, downtown issues are shifting with it, from traffic to transit to utilities to making sure that the new growth can spin-off to the rest of the city. The big focus now is on the Harbor Point peninsula. 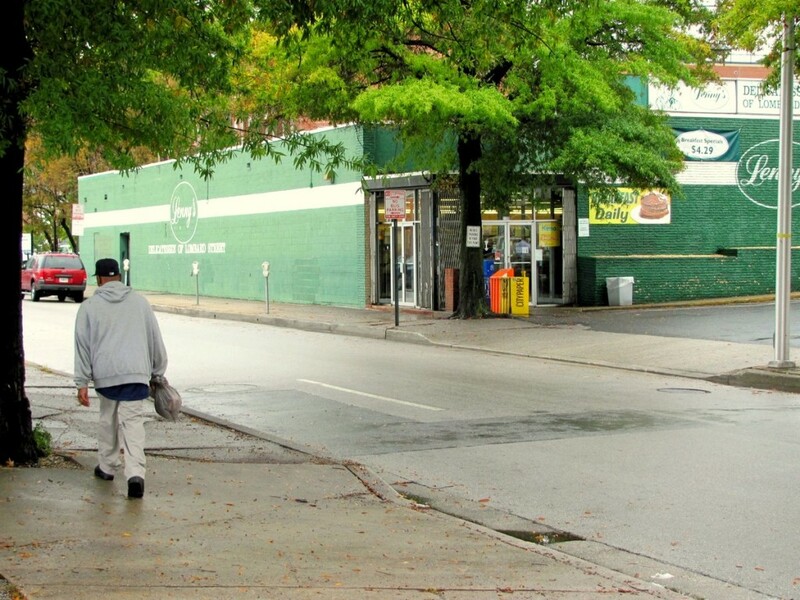 With only two access points, Central Ave. and Caroline St., each takes on greater importance. The isolation of Harbor Point means that unless Central can be made to work, Harbor Point won’t. Until fairly recently, the city had designated Central Ave. as an “Industrial Protection Zone” in an attempt to stave off the spread of downtown. That game is over. Now it’s part of the critical link between the old and new downtowns. The city has now begun construction of a $76 million plan to rebuild Central Ave. Phase One is a $43.8 million, five-year project from Eastern Ave. north to Madison St. to reconstruct the street all the way down to a massive underground storm drain. The projected completion date is August 2017. Phase Two, south of Eastern, was described in the city’s current capital improvement program as a $16.6 million design phase to be “coordinated with the design and construction of the Red Line,” which is the Maryland Transit Administration’s planned but totally unfunded multi-billion dollar light-rail subway line. TONIGHT: A public meeting on the extension of Central Ave. into Harbor Point will be held 6-8 p.m. at Stratford University, 210 South Central. Ave.
With Harbor Point project being accelerated (with juicy tax breaks) to include both new residences and Exelon’s regional headquarters, Phase Two has been extended to include a streetscape makeover of Central Ave. from Baltimore St. to Lancaster St.
At Lancaster St., a new 260-foot bridge would be built, extending Central Ave. into Harbor Point. The cost of these improvements have jumped to $32.9 million, with nearly $27 million in federal funding – and a $6 million match by the city. But the very uncertain timing of the Red Line’s 75-foot-deep subway excavation throws a wrench in the process. The streetscape (including new pavement, sidewalks, landscaping, lighting and other niceties) and the stormwater culvert just below ground cannot be completed until the subway is built. It’s all a big three-dimensional jigsaw puzzle. How well Harbor Point’s traffic and transit access can ultimately work is an even bigger puzzle. With only two streets to dump all of Harbor Point’s traffic into East Baltimore’s existing street system, particularly into already-congested President St. to the west (toward I-83) and Boston St. to the east (toward I-95) – the street network as a whole is very close to capacity, both physically and in the tolerance level of the local communities. Transit is the biggest piece of the puzzle. Given Harbor Point’s severe access limitations, drastically cutting car commuting is a must. But being on a peninsula limits transit just as it limits cars. It essentially rules out Harbor Point being an intermediate point along any “line haul” transit route, including the Red Line. On-site transit must therefore either terminate or circulate there. As such, there’s only so much the short-route Charm City Circulator could do, even if the city decided to pay to expand the system. The proposed Red Line station at Centrat Ave. at Fleet, if it’s ever funded, would be a three- to six-block walk from most of Harbor Point. Compared to all that, creating spin-off development befitting the “New Downtown” along Central Ave. should come naturally. Many pieces are already in place. Central Ave. is poised to be an education corridor, with Soujourner-Douglass College and Stratford University (formerly Baltimore International Culinary College) eager to assume a higher urban profile. Jim Palmer has a loft condo in the upscale Canal Street Malt House, at Central and Bank St.
Several other distinctive old buildings also have been adapted for impending yuppiedom. The remaining remnants of the factory district appear to be on borrowed time, not least of which is H&S Bakery owned by Harbor East/Harbor Point magnate John Paterakis. 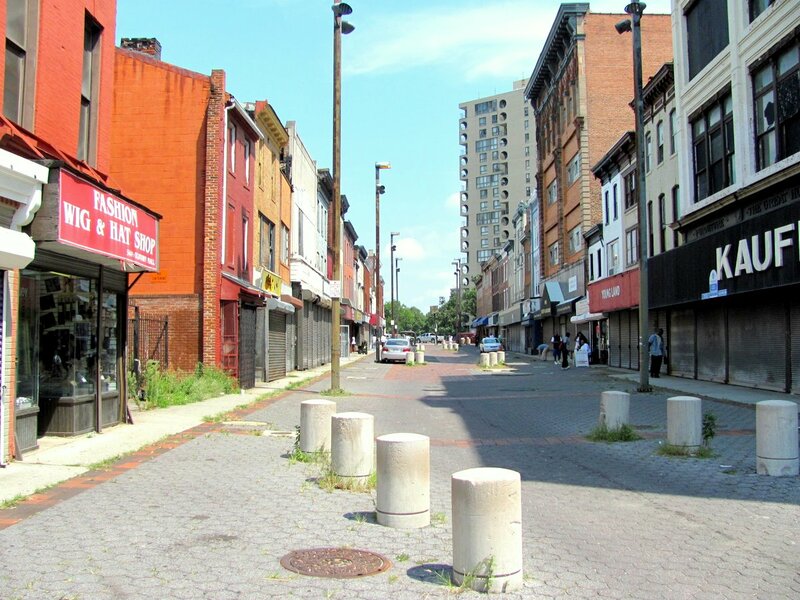 Perhaps the biggest spin-off potential is where Central Ave. straddles the corridor between now-desolate Old Town and the Johns Hopkins Medical Campus. 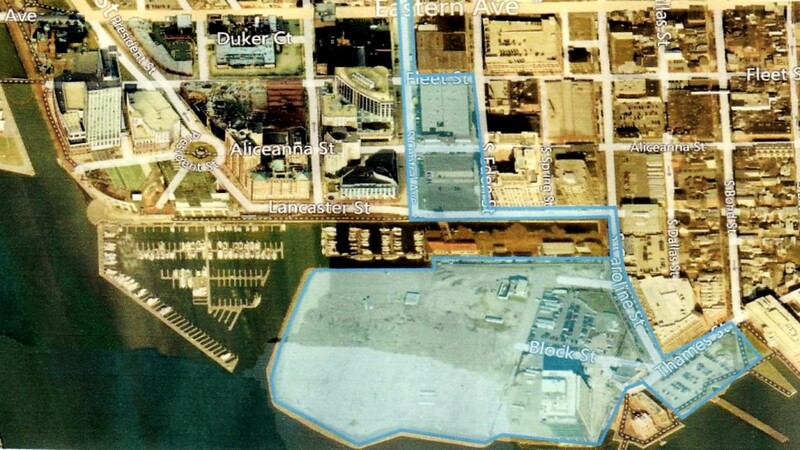 This would create a north anchor for Central Ave., complementing Harbor Point as the south anchor, and provide a much-needed presence to tie the latter into the real city. It’s ironic that Johns Hopkins and its partners are spending upwards of a billion dollars on their East Baltimore Development (EBDI) initiative to demolish and recreate a viable community north of the medical campus when virtually empty Old Town is sitting nearby beckoning. And in yet another billion dollar plan, the city has proposed to demolish the I-83 Jones Falls Expressway to try to link Old Town to the old downtown – even as Central Ave. is far better poised to link Old Town to the new downtown. Just as the old downtown has always fed uptown, the new downtown will feed a new uptown. Get ready for Central Ave. becoming the Charles St. of East Baltimore. In Baltimore, transit planning has usually been a moving target. Back in the 1960s and 1970s, the regional rail system was planned based on the quaint notion that downtown was the hub for a revolving suburban bedroom region, whence daddy would commute every day. But even then, sprawl was making suburbia self-sufficient from the city. In the 2000s, the transit plan was rearranged to reflect the urban waterfront growth that started when the city finally killed its 1970s expressway plan. But Canton development didn’t wait for the Red Line, and has already grown into a stable auto-oriented middle age. Other east rail extensions in the 2002 plan to Dundalk, Morgan State University, White Marsh and other suburban locations are all but dead due to dwindling feasibility. Now the transit priorities need to be refocused again on serving the new downtown, which exposes the weaknesses of the current rail plan. The two-block gap between the proposed Red Line and the existing downtown subway, patched by a long pedestrian tunnel, means that the system as a whole will be of limited use in serving Harbor Point. The MTA had several surface Red Line alternatives along Central Ave., all of which were far cheaper and more do-able than the chosen path. The best course now would be to dust off these plans and modify them to extend directly into Harbor Point to provide the best possible transit service for an area that sorely needs it. A surface rail-line would also create a highly visible motif for street development to build upon, instead of mere stairs, escalators and elevators leading 75 feet down into hidden subway catacombs. A surface Red Line along Central Ave. would also put its downtown alignment along Fayette St., which would allow a far better connection to the existing subway and great opportunities to strengthen the rail system as a whole. Other Red Line areas from the Inner Harbor to Canton and Highlandtown would be far better, less expensively and more easily served by extending the proposed Charles St. streetcar line. Because the Central Ave. Phase Two project uses the city’s share of federal funds, the proposed changes must be approved by the Baltimore Regional Transportation Board and amended into their capital spending program. Thus, the holding of a public meeting and open house at Stratford University tonight (Oct. 4). The comment submittal deadline is October 18. The five-year plan to rebuild Central Ave. is still only the beginning. Sooner or later, the city and region will need to reach a moment of truth on how transit for the isolated Harbor Point development can really work. The city’s Central Ave. project should be required to reserve street space for a surface Red Line instead of waiting for the MTA to dig a big hole. Gerald Neily was Transportation Planner for the Baltimore City Department of Planning from 1977 to 1996.